Does your child have difficulty with reading? Is your child's teacher complaining about behavior or attention issues? Is writing a chore for your child? Could your child be dyslexic? You are in luck. 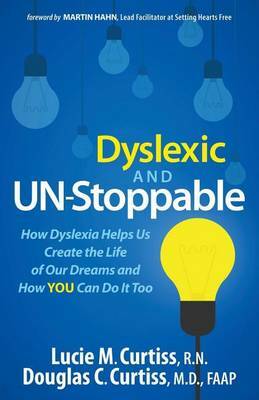 "Dyslexic AND UN-Stoppable" is not just another book about dyslexia. It is uniquely designed for both the dyslexic and non-dyslexic reader. "Dyslexic AND UN-Stoppable" shows you how Lucie Curtiss, discovered her own dyslexia at age 25, developed tools and strategies to become a successful entrepreneur. She honed these tools as she helped her dyslexic son excel at school. She then enrolled her husband, Dr. Douglas Curtiss, a Yale-trained pediatrician, to contribute to this book. Together they show you how to implement these strategies in your life so that your dyslexic child can be UN-Stoppable. You ll find practical insights, real-life success stories, and online video tutorials to help your dyslexic child with reading, writing, spelling, math, and much more. Another word for dyslexia is smart. So use these powerful strategies, discover your unique talents, and become UN-Stoppable!"